Kabul (Agenzia Fides) - "With regard to the recent agreement announced between the United States and the Taliban, I can only agree with the position of Afghan President Ashraf Ghani: in a situation concerning a specific territory, its democratically constituted authorities cannot be cut out from a discussion concerning the future of that Country. Although this dialogue has led to a positive data, namely the Taliban's promise not to support any form of internal or external terrorism in the country, in exchange for the withdrawal of NATO troops, decisions cannot be made or plan the future of a nation by cutting out who governs the country". This is what Fr. Giuseppe Moretti, missionary in the Islamic Republic of Afghanistan from 1990 to 2015, and first Superior of the "Missio sui iuris" established by the Holy See in 2002, told Fides. The Barnabite's reflection touches the results of the talks that took place in Doha, Qatar, between US government officials and the Taliban movement, but also the recent statements about a possible withdrawal of Italian troops from Afghanistan, within 12 months. In this regard, he states: "It is still all unclear, they are only hypotheses. 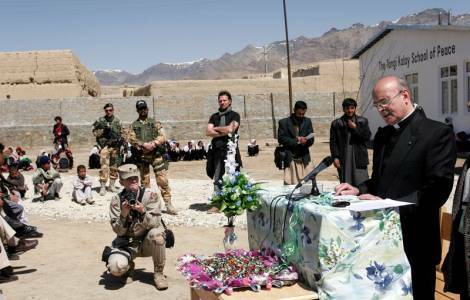 But it is also true that the time has come to ask what is the task of the Italian presence in Afghanistan. I can testify, that the Italian soldiers have done an excellent job of preparing the local troops: their contribution is out of the question and we must recognize and praise their contribution. However, 600-700 soldiers alone can do very little in such a complicated area, where there are still terrorist attacks of which soldiers and policemen are the main targets".